Metroid Fusion GBA Game Boy Advance Game Cartridge Cleaned Tested and Guaranteed to Work! Probably my favorite GBA title, I can't get enough of the spooky abandoned space station atmosphere, and the great boss battles come one after another; you're always feeling like there is something huge around the corner that wants to kill you. As per all the cartridges I have purchased so far from Lukie Games it was clean, the label was in good condition and of course the game works. Will be using this site for expanding my GBA collection further. When this game first came out I was already on the hype train. 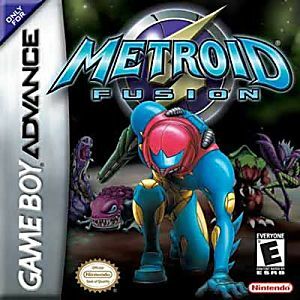 I loved Super Metroid and Metroid Fusion I thought was better because I could play it anywhere! The graphics, the soundtrack, the new mechanics made it memorable and gave it enough to make it feel like Super Metroid but also gave it it's own personality. Anyone who loves the Metroid series needs this one! I purchased Fusion along with Zero Mission to begin and end the story. The game itself was incredible when I was younger and obviously hasn't changed. As always, Lukie Games was a pleasure to do business with. Came in great condition and worked. This game was again in perfect condition. Played it and men did all by memories for the game came back. This is a really awesome game and damn that final boss XD. Package received in great condition, awesome game, what's not to love! This game, in my eyes, in one of the best Metroid games in the series. At first, I didnt know much about Metroid and wasnt really interested. After looking into this game however, I found myself deeply intrigued. This game started it all for me and I now own every Metroid game ever made. The only other Metroid game that can be compared to how great this one is would be Super Metroid. Which I also strongly recommend. The music is astounding and the gameplay is that of the classic Metroid for NES. I strongly encourage the purchase of this item. Ever since the first metroid game, the series has been known for giving an ominous sense of loneliness and foreboding. Metroid Fusion takes it a step further, by having the game's primary villain(against whom you are powerless until the end of the game)suddenly pop up unexpectedly throughout the game. The boss battles are challenging and many of the puzzles can be frustrating, but the game is addicting and fun, and each success rewards you with new power-ups and a sense of achievement.